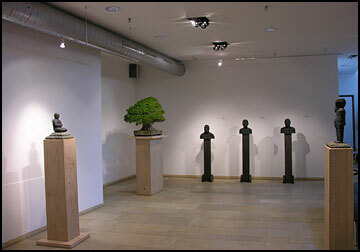 "Boaz Vaadia - Stone Pieces"
In September 2006 Galerie Terminus, located in Munich, Germany, mounted an extensive show of Vaadia works. 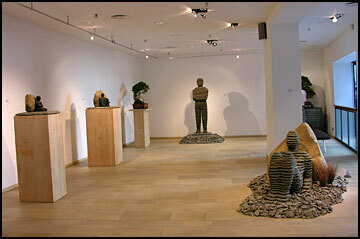 A selection of the over 28 pieces installed at the gallery are represented in the photos that follow. 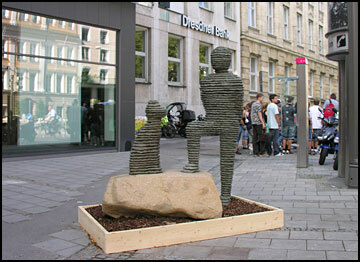 Out in front of the main gallery sits "Asa and Yehoshafat". 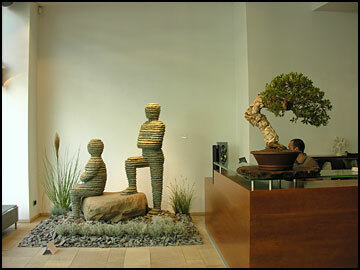 Walking in past the reception area of the gallery we find the large bronze, "Ba'al & Yizhaq". 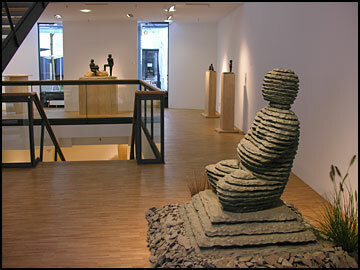 In the upstairs section of the main gallery we see "Mahli" and "Ge'u'el" sitting on pedestals along the wall, "Avadon" standing in the back and "Ahiam 2nd" reclining near the window to the street. 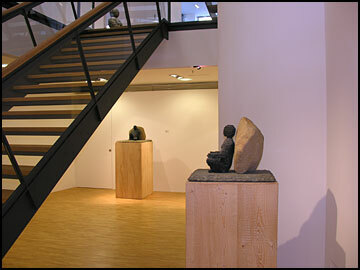 In the downstairs space, the bronze "Mahlon" sits on the left facing the bronze "Sara & Rivqa". Stone head portraits "Troy", "Leisa", and "Jesse" line the back wall. 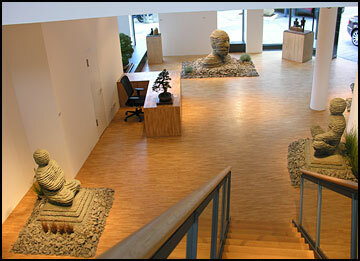 Galerie Terminus proudly opened its new grand exhibition space with Vaadia's show. 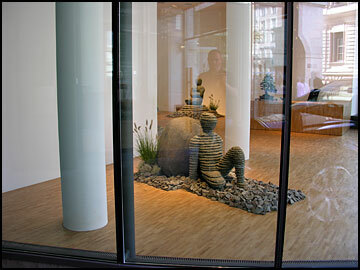 "Yo'ah with Dog" is positioned on the plaza out front of the new space. Looking in from the street on the grand exhibition space we can see "Ginnetoy 2nd" in the foreground and "Ba'al-zevuv" seated behind and to the left. Looking down from the Galerie Terminus offices we can survey almost the entire upstairs portion of the new space. Clockwise from left to right: "Ba'al-zevuv", the original stone piece of "Mahli", the large stone head portrait of "RAFFAEL", the small bronze "Omri & Shemaryahu", and the life-size "Elyaqim". Using "Ba'al-zevuv" as a pivot point we can see the remainder of the pieces on this floor: the new stone piece "Ah'av and Ovadyahu" is against the far wall; the bronzes "Two Dogs" and "Milka" are along the right wall. 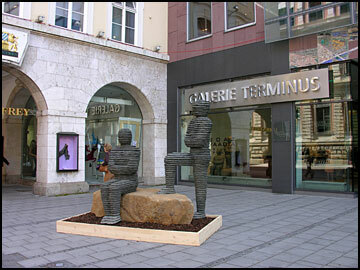 We are now on the bottom floor of Galerie Terminus' new gallery space. There's "Ba'al-zevuv" again at the top of the stairs. 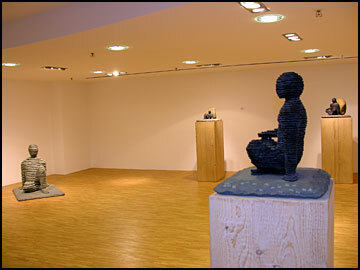 "Efrayim" sits against the far wall and "El'azar" is in the foreground. Also on the bottom floor of the new space: (from left to right) "Ginnetoy", "Yissakhar", "Deqer" (in the foreground), and "Deqer 2nd".